Brad Dunn focuses his practice on complex business litigation and commercial transaction representation, including representing clients in mergers and acquisitions, contract disputes, insurance coverage disputes, product liability and tort defense litigation. Mr. Dunn regularly defends Fortune 500 companies, debt buyers, debt collection agencies, law firms, lending institutions and others in class action lawsuits involving claims brought under various state and federal consumer laws, including the Fair Credit Reporting Act (FCRA), Fair Debt Collection Practices Act (FDCPA) and the Telephone Consumer Protection Act (TCPA). Mr. Dunn also has extensive bankruptcy and reorganization experience focused on assisting clients (both debtors and creditors) with solving problems pertaining to insolvency and potential insolvency situations. Prior to joining Hinshaw & Culbertson LLP in September 2014, Mr. Dunn was an associate attorney at two other Phoenix area law firms. He also spent two years as a law clerk in-house with a U.S. developer, manufacturer and distributor of self-defense products. 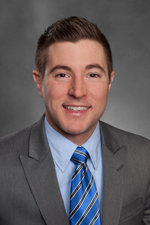 During law school, Mr. Dunn was a Willard H. Pedrick Scholar, Faculty Merit scholarship recipient, VITA volunteer tax preparer, and Innovation Advancement Program business clinic student attorney. While earning his M.B.A., Mr. Dunn was a member of the Beta Gamma Sigma honor society, and during his undergraduate studies participated in the study abroad program at the University of Urbino in central Italy. Prior to his legal career, Mr. Dunn was a senior financial analyst for a global aerospace corporation. In his spare time, Brad enjoys spending time with his wife and son.